"Worship, Warfare and Intercession before the Throne of God" was born from the foundry of over twenty-three years ministry of prophetic intercession for the nations. Bob travelled with prophetic intercessors to China and Japan in the Far East, and to many nations on the continents of Asia, Africa, Europe, the Middle East, the Americas, Canada and Australasia. In 2010, in a vision, Bob was caught up into heaven, where the Lord gave him a glimpse of the worship, warfare and intercession before the throne of God. Later, God told him to write the book. 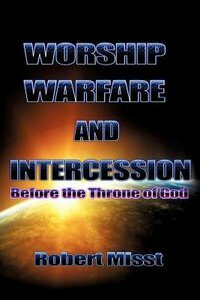 "Worship, Warfare and Intercession before the Throne of God" is that book. This book teaches us how we can pattern our worship according to the worship in heaven. It calls us to join with heaven, in intercession and warfare, for the return of the Lord and the setting up of His kingdom on the earth. Events are unfolding at a rapid speed, and the church, the true bride, must get herself ready. Heaven waits to hear her voice, as one sound with heaven. This book has two parts. Part I describes the worship that Bob experienced in heaven. Bob teaches about the seven aspects of worship in heaven, and how they are key ingredients for our worship in the last days on the earth. He has teamed with Jill Shannon (see www.coffeetalkswithmessiah.com) who produced a worship CD which puts the teachings into a practical manner. This CD is really awesome. Part II of the book is about intercession in heaven. As each seal of the scroll is broken in heaven by the Lamb, the book explodes with the reality of the intercessions in the book of Revelation. These intercessions born out of worship, move events towards a definite purpose: The restoration and renewal of the earth for the return of King Jesus. Heaven invites earth to join in this ONE SOUND of worship, warfare and intercession. The final chapter of the book offers practical suggestions how to use the book and CD for worship and intercession for small groups and larger groups. About "Worship, Warfare and Intercession"